What do I need to do to get started on my website? We create customized websites for all professionals in the childbirth field, including: birth doulas, postpartum doulas, midwives, childbirth educators, lamaze instructors, baby nurses, nannies, infant massage specialists, pregnancy massage specialists or any other profession related to babies and childbirth. Here's a rundown of the website services we can offer to your childbirth business. Up to five pages of customized website content. 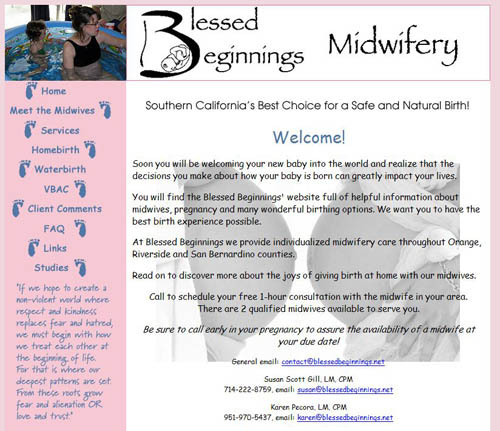 Most doulas and midwives want the following pages (in addition to the home page): about page, services page, testimonials page or a links/resources page and a contact page. Your website will also include a free additional site map page to help boost your page rankings. A tailored, customized website design that uses custom colors, photography and graphics to give your website a unique, clean look. We can also design your site around your logo to make everything match. The latest search engine optimization techniques are included with every website we build. We optimize your website's content to your keywords and related local areas to make sure you get to the top of the search engines to help your potential clients find you. Google webmaster tools are included to help track your website. Customized contact forms with spam prevention techniques to help your potential clients get in touch with you without adding spam to your inbox. Additional web pages are $150 per page. This includes all of the services listed above. We will use your current content on your website and optimize it for keywords in your related field and local area. If there are any current elements you want to keep from your site (like your logo, or some of the same colors) we can do that as well and give your website a fresh and updated look. Total: Starting at $800 for 5 pages, each additional page is $150. Keep your website's content up to date and fresh with a new custom blog. A blog can help with your search engine rankings by providing new content onto your website. Use your blog to offer advice to new parents, be a resource to parents, offer specials or discounts, advertise new services or products, recommend books for reading or new products and much more. If you need a logo designed to represent you and your new doula, baby nurse or other childbirth related business, then look no further! We can provide you with logo design to be incorporated into your new website or do logo design as a standalone project for your business cards, flyers, postcards or other advertising materials. Logo design is $150. Need your current website updated to reflect some new information about your business (have you changed your prices, updated your doula or midwife services, extended your service area, or have more client testimonials or link exchanges to add to your website)? We can work with all clients - whether or not we have created a website for you - to maitain and update your website. Just drop us a line and let us know what you need updated and we'll work on it right away. Website maintenance services are offered at $50/hr, 15 minutes minimium. "Mary made my dream of a wonderful new web site a reality. For an extremely affordable price she exceeded my expectations and developed a gorgeous site faster than I knew was possible. She has an acute talent and is so pleasant to work with. I love my site, and I'm happy to recommend her services to anyone needing an astounding web site." "Mary did an excellent job integrating the ideas and desires of THREE women and the results are magnificent! She truly made our ideas come alive. Numerous compliments have been received from viewers of our web site. Our expectations were wonderfully surpassed and we highly recommend Mary for your web site needs." 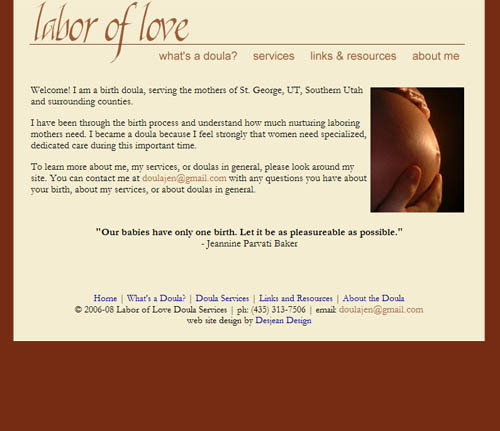 We create custom websites for doulas, midwives, baby nurses and other birth professionals. We offer redesigns, logo design, custom blogs, SEO optimization, and other web services. Copyright© 2009 Desjean Design, a division of Sugar Branch Designs.